Replaces 9781908684851. 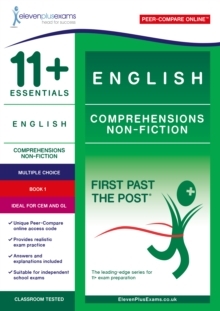 English comprehension tests have long been a staple of 11 plus and common entrance exams. This book contains extracts from non-fiction literature. These tests, based on conventional classroom testing sessions, are representative of the standard comprehension section of multi-discipline CEM style 11 plus exams. They provide good practice for all examination boards. Extensively road-tested by Eleven Plus Exams, all 11+ Essentials tests are best used as real exam practice to benchmark a child's performance.